2..39″ Thick x 2.25″ Wide Profiled Handrail. Available in 8′, 10′, 12′, 14′, and 16′ Sections. Solid Cap (SC) – will allow 1 joint in top ply on 14′ & 16′ pieces with multiple joints in each of the bottom two laminations. Odd species may allow more than 1 joint on the top ply depending on the length. 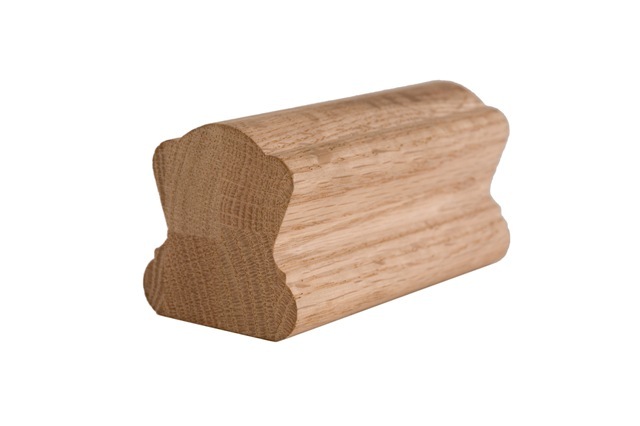 Fingerjoint (FJ) – The top ply will allow approx 5 joints per 16′ rail and the bottom two laminations are made from finger jointed blanks that are 6″ & longer.All handrail profiles are available with a plow.